Anyone who knows me well, knows I am not keen on seaside towns. However, if I had to pick one as a favourite, it would have to been Whitstable (pronounced witstabal) with a little sea front and small shops and lots of tea rooms and restaurants! Even the lovely two churches hosts weekdays tea room – well worth a visit and a chat to some of the senior Whitstable people..! I visit The Orangery Tea Room frequently and decided to take lunch on my last visit. The views from the tea room were very nice. The tea room is split up into two rooms. One traditional with wood panel walls and a lovely old fire place which has been sadly boarded up, with old style wood tables and wooden chairs. Lovely wooden beams make this side of the tea room traditional and I liked it. The other side of the tea room has a modern feel but lovely décor. There was a pianist but this was too loud for a small tea room. I had originally sat down, but moved to the traditional side as the piano was loud and people were speaking loudly to hear each other. There was a normal menu consisting of sandwiches, baked potatoes, scones, freshly made cakes etc. Speciality teas and cold beverages were also offered. A Whitstable Castle High Tea consisting of savoury sandwiches and cakes looked appealing. There was a daily special board and I chose a roast chicken meal which was very nice, although the roast potatoes were over cooked, which made them a little hard. The meal was supplemented by a pot of English tea. I can recommend this lovely, warm tea room. 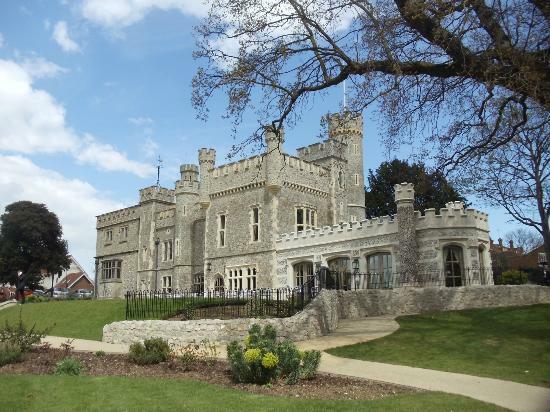 I guess the tea room would look stunning in the summer months as the Castle is superb and in September of 2010 saw completion of a £3.1 million pounds restoration. The Chief Executive, Darren Simpson showed me inside the impressive castle. Lovely place indeed.